After a night of shivering on our first night at Yellowstone, we got up, and made pancakes in the camper. YUM! Once everything was all cleaned up, we left for Old Faithful. 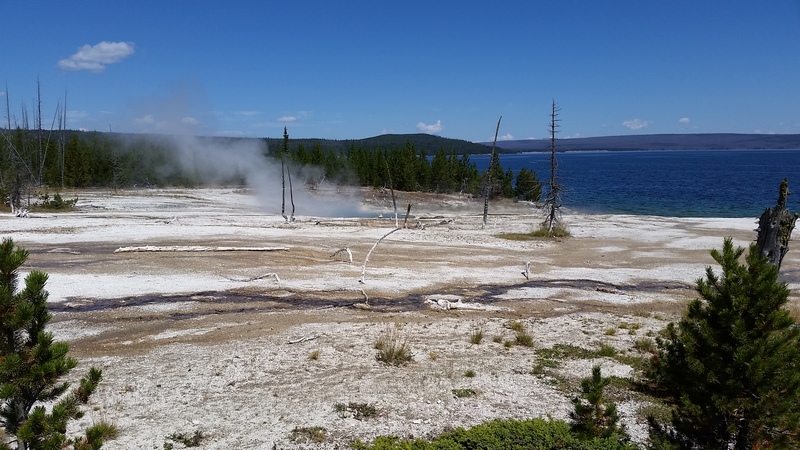 The West Thumb Geyser Basin, with Yellowstone Lake in the background. On the way, we stopped at West Thumb to check out the hot springs there. When we first saw this area from the road, our first thought was that there was a fire there, due to all the steam. 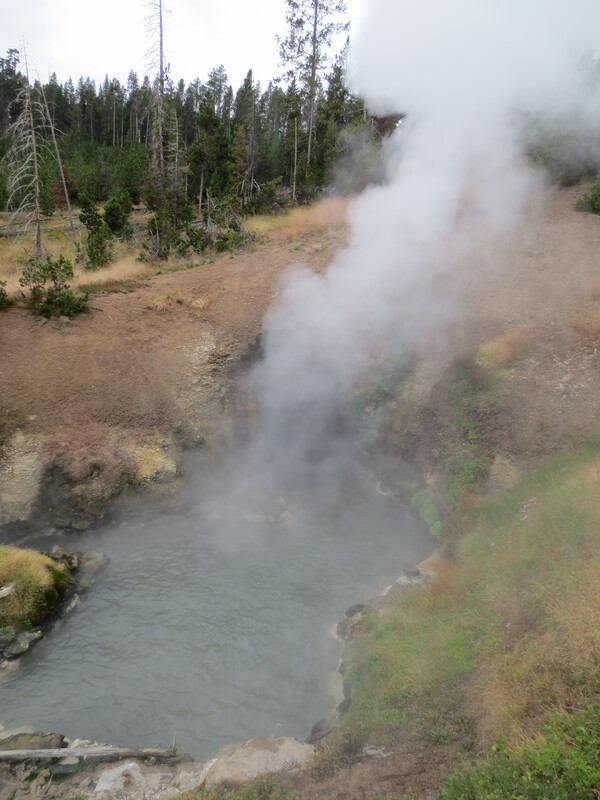 We quickly learned that billows of steam are tell-tale signs of hot springs or geysers in the area. This was our first glimpse of the hot springs and a couple of mudpots. It was beautiful with the backdrop of Yellowstone Lake. There were a couple of geysers right at the edge of the lake, which were pretty cool to see, though, we didn’t see any erupt while we were there. We did see a large group of kayakers were going along the lake near the geyser basin. I wondered how warm the water was down there. After West Thumb, we headed to Old Faithful, where it took us over 40 minutes to find a parking spot! I would recommend going early in the day, instead of mid-afternoon, like we did. Once we parked, we had a picnic lunch in the car before heading to see the most predictable geyser in Yellowstone. They had times posted as to when it was “supposed” to go off. Times are +/- 10 minutes. Amazingly – it was pretty much right to the minute! There were seats all around the huge fountain for people to sit and watch. 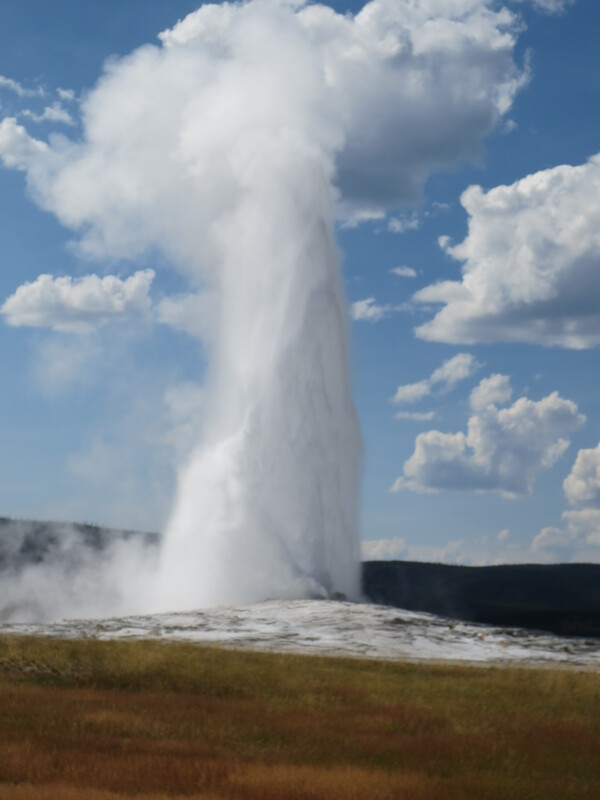 At first, Old Faithful just started sputtering a little bit of water. The water got higher and higher. It went for about 5 minutes or so, then it was done. It wasn’t at all what I expected. I guess I expected to hear more sound from the water, or something (like in the cartoons). It was actually fairly quiet. One of the dads from the dance studio said his initial reaction to Old Faithful was pretty much the same. Castle Geyser, one of my favorite geysers surrounding Old Faithful. There are several trails around the geyser to explore. We did the “main loop” on that day, and went back on Thursday to see the parts we missed. As we were walking around the trails, we all got sprayed by a geyser. What was interesting, was that all the males in our group thought the water felt really hot, and hurt. When Grace and I walked by a couple minutes later, we thought it was icy cold, and felt good on such a hot day. The trails are fairly lacking in shade, and the sun was intense. A few of us ended up with a bit of sunburn. We remembered the sunscreen later in the week. Also, with all the walking/ mild hiking we did, we were glad to have tennis shoes in addition to sandals. Grace wore her flip flops the first day we were at Old Faithful, but wore her tennis shoes most of the rest of the week. We all had back up tennis shoes too, in case it got rainy, or our shoes got wet. Jason, Michael, Grace, and I at the Mud Volcano area. Wednesday, we had a slight change from our original plan of visiting Mammoth, due to needing to find a hardware store that carried a part we needed to fix part of the camper that broke. We ended up heading to West Yellowstone, which is just outside the park boundaries. It was a cute little town, that we may visit again to explore more. An added bonus, is that we got to explore areas that weren’t in our original plan, and we saw many elk and buffalo that we wouldn’t have otherwise seen. Dragons Mouth Spring, the loudest of the springs that we heard in the Mud Volcano area. Anyway, on the way, we stopped at Mud Volcano. This was a cool area that we passed a couple of times during the week. It was a chilly, drizzly morning, and half the kids wanted to stay in the car, and not explore. The rest of us got out, and carefully walked the trails. We had to be careful, because this is, apparently, a favorite area for one herd of buffalo to hang out. There was a huge one at the top of a hill overlooking the winding path. Since my husband was wearing a red hoodie, and my son had on red pants, I was a little nervous that he would charge, but he was more interested in watching. Thank goodness!! One thing to note about the Mud Volcano area – it is one of the stronger sulphur-smelling areas we visited. I was especially glad for my bandana to cover my nose on that day! I think this was across the street from Mud Volcano. 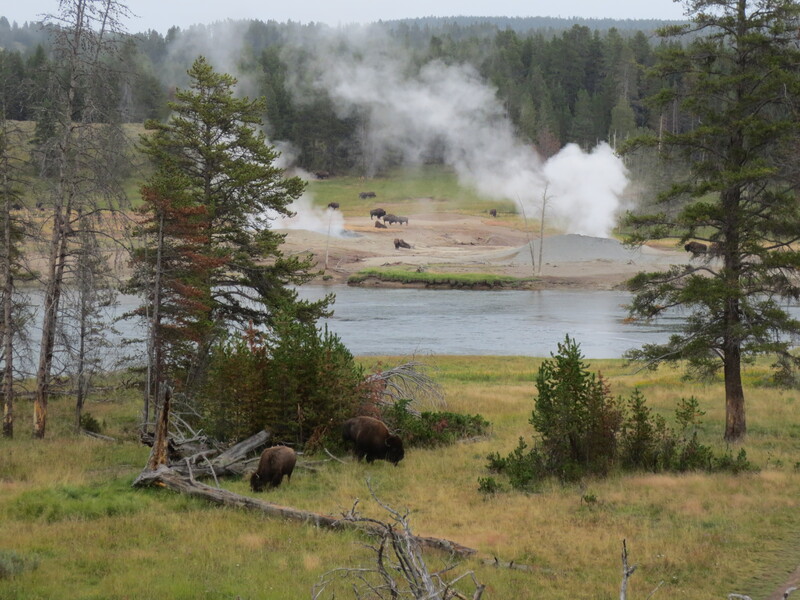 The buffalo seemed to be drawn to the springs areas. 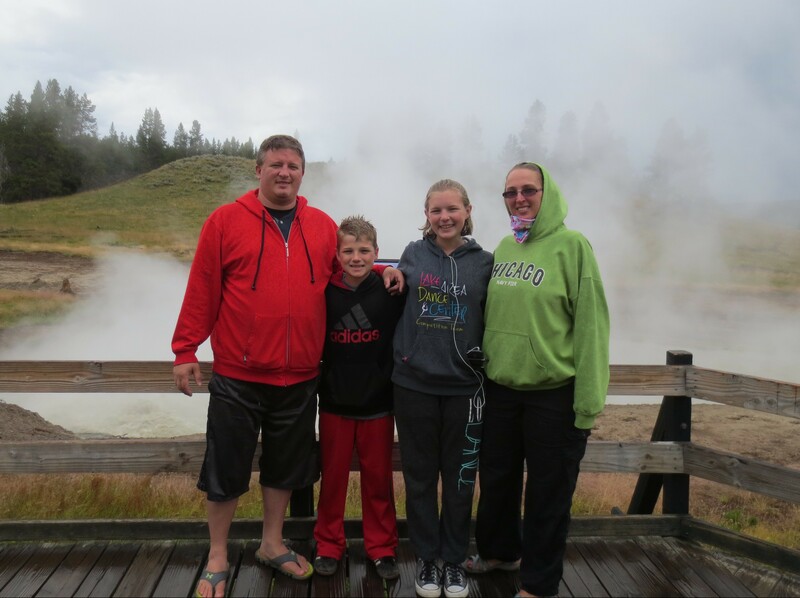 We went to Old Faithful early to avoid the parking disaster we had earlier in the week. This was a good idea! Not only did we get to park right away, we got to walk the trails we had previously missed before it got too hot out. After a delicious lunch in the cafeteria at the Old Faithful Lodge, we left to explore the rest of the Upper Geyser Basin. 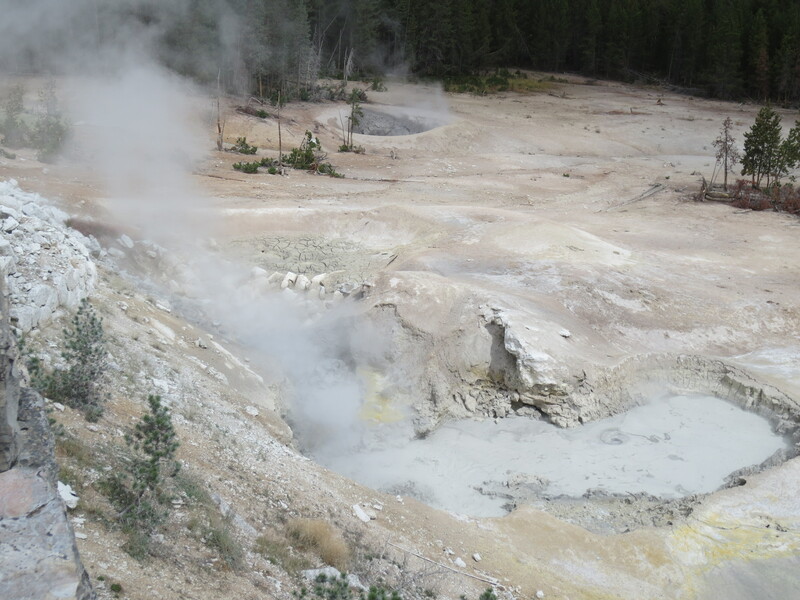 One of the geysers we saw near the Biscuit Basin (north of Old Faithful) was called Artemisia. Nearby, was the Morning Glory Pool. Jason and most of the kids were ready for a break from the sun and walking, so Michael, Nikolai and I hiked to these two on our own. We were glad we did – they were gorgeous! My two hiking buddies – Michael and Nikolai! 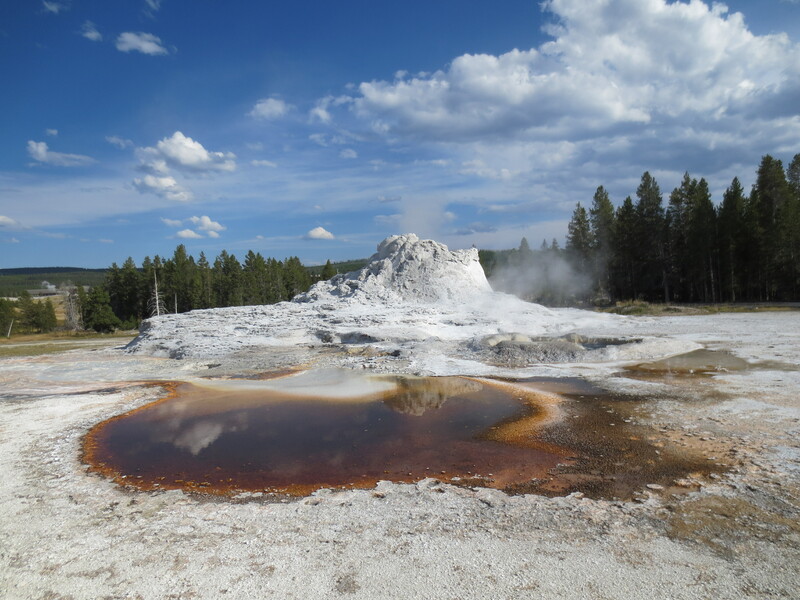 We also explored the Black Sand Basin, the Midway Geyser Basin, and the Fountain Paint Pot areas on Thursday. The Midway Geyser Basin was pretty cool, because it had some gorgeous pools and springs. 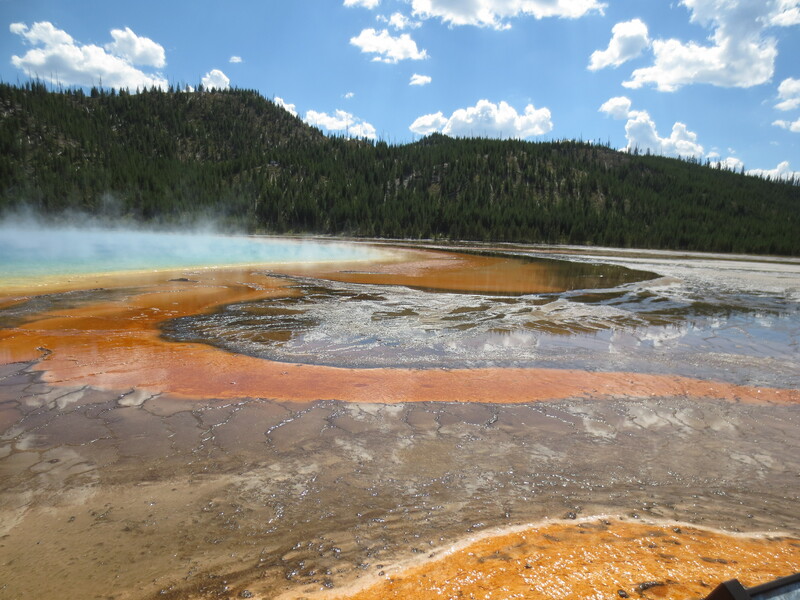 One of the highlights of this area is the Grand Prismatic Spring, the largest hot spring in Yellowstone. I wish the walkway were somehow elevated here, because being level with the spring, I felt like we missed out on the true beauty of it. I have seen pictures taken from the air, and it is much more gorgeous than we could even see. The clarity of all the springs, especially those in this area were amazing! Another cool part of this area was the water that was draining into the Firehole River from here. The last of the springs we visited was the Sulphur Caldron. It was definitely the stinkiest place we visited. The bandana didn’t even kind of help, and Michael didn’t want to stand still long enough for a picture because it smelled so bad. Fun fact, this spring has a pH level just below that of battery acid. You definitely wouldn’t want to touch that one! 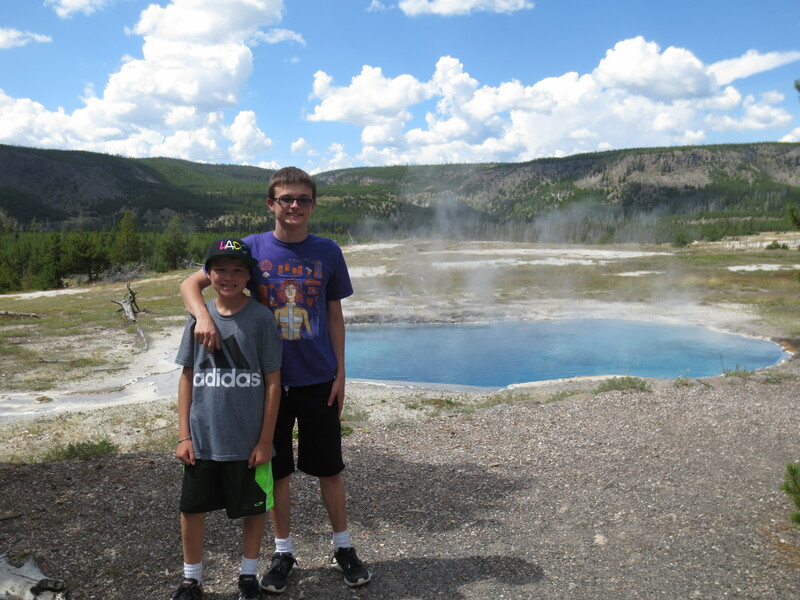 Sulphur Cauldron – the stinkiest place we found in all of Yellowstone Park. Because of our change of plans on Wednesday, we didn’t get to see the hot springs at Mammoth. The next time we go back, we will definitely be taking a day to explore this area more.